February 12, 1809. Both Abraham Lincoln and Charles Darwin were born. Some days can be momentous that way. Although I’d known about this coincidental birth for some years, I had supposed it was one of history’s curiosities and nothing more. 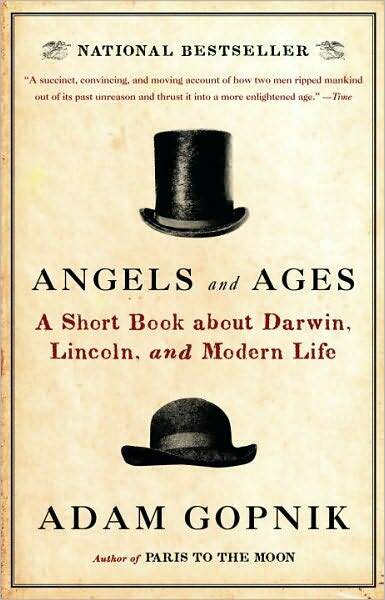 Adam Gropnik’s Angels and Ages: A Short Book about Darwin, Lincoln, and Modern Life changed all that. What’s more, while both Lincoln and Darwin are secular characters, the book has a strong dose of how religion influenced and perhaps even emanated from ideas both of these giants had. Religion actually surfaces throughout much of the book, although Lincoln grew up as a skeptic, and certainly was not a “church goer,” and Darwin was groomed for the clergy but came, through nature, to have serious doubts about God’s existence. Religion may not be Gropnik’s main point, but it has a way of following these two historical figures around. Using a biographical and intellectual parallelism, Gropnik lays the two men side-by-side in their Victorian lives and shows how death was really a factor that bound them. Both lost a beloved child at about the same age, and both found death’s pervasiveness a problem for believing in any kindly God. Of course, we all know that none of us would be here now if our forebears had not passed on, making room for us. It is the way of nature. Nature is hardly kind or just, however. Ringing throughout this fascinating exploration is the ubiquitous problem of theodicy—in a world of such palpable suffering, where, indeed, has God gone? How do we continue to believe when all the evidence is contrary? Some of our greatest doubters have become our greatest guides. I appreciated especially how Gropnik ends his little book with some thoughts on religion. He makes the essential point that Darwinism, by definition, cannot be a religion. Even better is the clear-eyed vision that he has that religion and science are both needed by people and they may both be held as true. Even when they’re fighting. The truth is nobody has all the answers. Those who brashly dismiss religion or science are equally wrong. In his eloquent style, Gropnik makes a decidedly sane suggestion that we should learn from our assertions of pluralism. We are accustomed to thinking about much of life and culture as being equally valued, no matter where on the planet we find it. Why can we not do the same with truths? Some will find meaning in science and have little time for faith. Others will find religion to be their ultimate and will not be bothered by science. The vast majority of us are somewhere in the middle. And what brought us to this point was the fact that February 12, 1809 was such an extraordinary day.